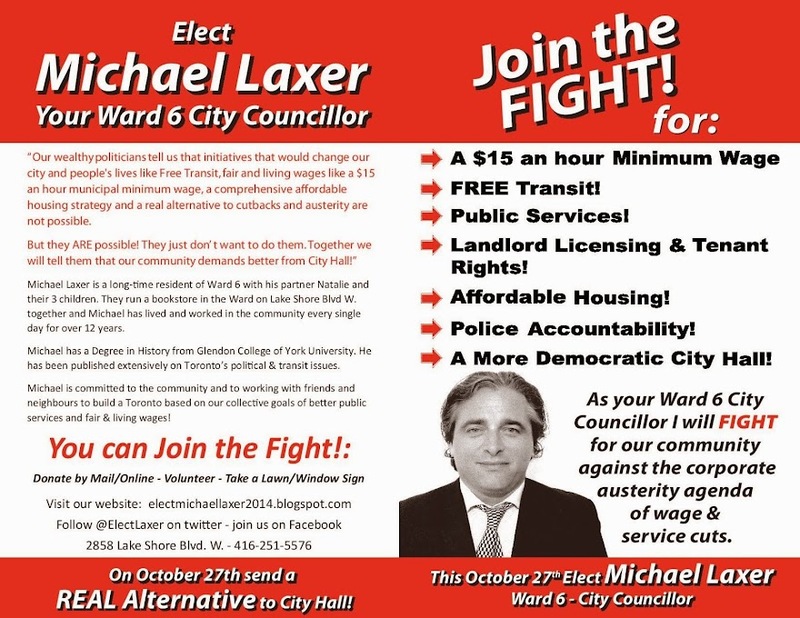 Elect Michael Laxer - Ward 6 City Councillor 2014: Why Socialism? Socialism is the idea that we can create a society whose primary objective is to generate economic and social justice for all by fostering conditions of equality in which each of us is allowed to thrive and pursue the dreams and personal objectives that they wish to, regardless of the fate of their birth, colour, gender, or any other systemic problems. It is the idea that every individual is entitled to the self-worth of personal actualization that is only possible when we create conditions that allow for an equal starting point. It is the principle that we have the right to be who we are, to love who we want, to express ourselves as we wish, without the state, the church or the arbiters of community values having the power to stop us. It is the sense that we should, through the democratization of the economy, allow for workers to play a greater role in running their companies and that the government, our government, should represent the interests of the vast majority of citizens ahead of the corporate few. The Socialist alternative, the actual dream for a better future, continues. It continues because the human spirit cannot endure such appallingly unfair and egregious inequality as exists today without many millions of people feeling that there must be a better, a fairer and a more just way to create and distribute wealth. The human spirit cannot abide the disgrace of six-year olds going hungry or facing homelessness in nations that hand tens of billions of dollars out to corporate entities. The human spirit recoils at the violence inherent in the reality of our present state of social insecurity created by supposedly progressive liberals and democrats, and social democrats who, throughout the '90's, actively participated in the vile attacks of the political class on the unemployed, unions, health care, welfare, public spending, education and more and who now stand rudderless and stunned in the face of the collapse of the very system that they engendered. Socialism is the voice of the poor, the workers, the middle class, the disenfranchised, those who wish to express themselves without the oppressive weight of church or state, and those who stand against the terrible toll that economic instability takes on people and families. Socialism is an antidote to apathy and the irrelevance of a life that sacrifices security, justice and freedom for material reward. Socialism is not just an alternative, it is the only true alternative to our present course, it is a vision of a better world that does not rely on hate, fear or religion, but instead takes the needs of human beings as its starting and ending point. It is, at its best a process that never reaches a conclusion because the human condition can and will always be made better by people themselves. It is a spirit of constant yearning to make a world with peace, equality and democracy for all, regardless of race, religion, gender, sexual orientation, or economic starting point.